Home › Promotions › Get Ready to Ride! 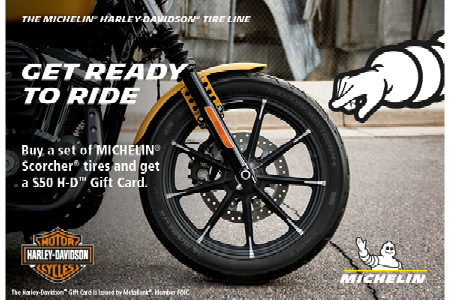 Purchase a set of qualifying Michelin® tires from an authorized Harley-Davidson® retailer and receive a $50 Harley-Davidson™ gift card when you purchase a new front and rear Michelin® Scorcher® tire, or get a $25Harley-Davidson™ gift card when you purchase a single Michelin® Scorcher® tire. Harley-Davidson™ gift cards will be provided by Michelin.